Glaucoma is a progressive optic neuropathy characterized by a specific pattern of optic nerve head and visual field damage. Damage to the visual system in glaucoma is due to the death of the retinal ganglion cells, the axons of which comprise the optic nerve and carry the visual impulses from the eye to the brain. Glaucoma represents a final common pathway resulting from a number of different conditions that can affect the eye, many of which are associated with elevated intraocular pressure (IOP). It is important to realize that elevated IOP is not synonymous with glaucoma, but rather is the most important risk factor we know of for the development and/or progression of glaucomatous damage. Are alternative medicine really helping glaucoma patient? David what do you think of this abstract? 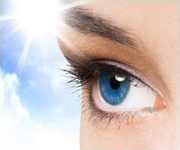 Read more about Are alternative medicine really helping glaucoma patient? If I may, what are your thoughts with regard to the attached study which appeared in the July 2008 issue of Molecular Vision? It purports that a proprietary combination of bilberry and pine bark extracts in a 2:1 ratio successfully lowered IOP by 3 mm Hg in pre-Glaucoma subjects after three months.